I'll give this a few days and collect all my 'findings'(among others, AUv3 goes 'silent' after freeze/render in Cubasis) and get back to the dev with a proper report. GUI is 'iPhone only' for now but scales quite nicely. It is a worthy successor to the original Squaresynth with separate smooth option per table and a new filter to boot, yummy! Awesome! I thought the developer had skipped town when Squaresynth dissapeared; very happy to see AU3. Bought! TIP: To reduce polyphony to mono, enable glide and set amount to zero. For those of us with a slew of synths (which we guiltily may or may not use as much as we'd like) is there anything particular in your opinion that would recommend this as a worthwhile addition? If one already has the original Squaresynth (and likes the sounds) the sound is almost the same but with the added multi-mode filter and extended modulation tables(ie. step sequencers). Doug @thesoundtestroom did a video of the original Squaresynth long, long time ago. @Samu .. how is the Au automation functioning? I do feel that the AUv3 implementation needs to be looked at by the dev at some point to 'fix' at least the Cubasis freeze issues. 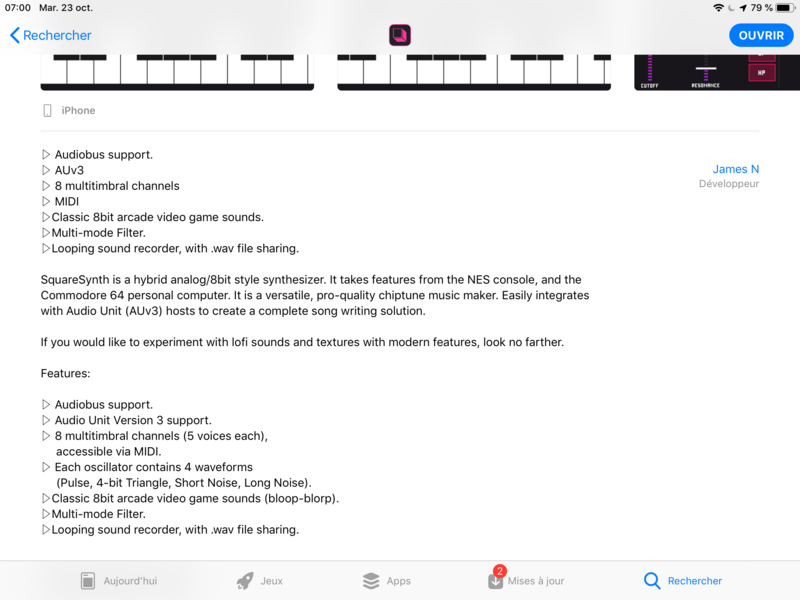 (I had the same type of 'problem' in GarageBand where the AUv3 went 'silent' after a track merge). I've mostly been having fun creating some sounds for it and 'sampling' them into BM3. As far as I can see no AUParameters are exposed yet. how is the au automation in Cubasis? i don’t mind the freeze issue for the moment.. i presume its not a cpu heavy synth.. and i am also presuming ( presumptive.. moi? ) that you just have to restart cubasis to get the sound back?? I loved the old square synth so am tempted by this.. annoyingly times is hard and i am trying not to spend up my itunes balance too quick in case of ‘ interesting things’ appearing from nowhere... at the moment i try and find an app i have that will cover a prospective purchase before splashing out... in this case the nearest was Enkl ( outside of Kamata in Gadget... come on you gadget Au’s!! ). but I’d forgotten how unreadable the labels are on Enkl.. and thats on a 10.5 screen!! the au doesn’t resize either annoyingly.. Remember I'm a recovering app-o-holic too and try to plan ahead. Another way to work with the app is to load it as a regular IAA App (not as AUv3) and treat it as an 8-part multi-timbral sound module and record the output into Cubasis. One question that bumps to mind is what would need automation in Cubasis considering that the tables can be used to modulate Pitch, Wave, Pulse Width, Gain & Filter. And it's Velocity Sensitive? (All other parameters can be assigned to the 3 sliders which I presume are possible to control via Midi CC but no manual yet so I can't check). well that’s nice to know.. maybe filter control over a slower and longer length of time? maybe change the waveform at a specific point in time only? au automation in cubasis is my most often asked question.. it’s the one daw where devs often have a hiccup with it on app launch ( because of... well, you know, we don’t have to have that conversation again .. ) but its where i like to play most often so the question is always there on the tip of my tongue..
For those cases I'd recommend another AUv3 filter on top with more 'bite' on top be honest. I do get what you mean though. 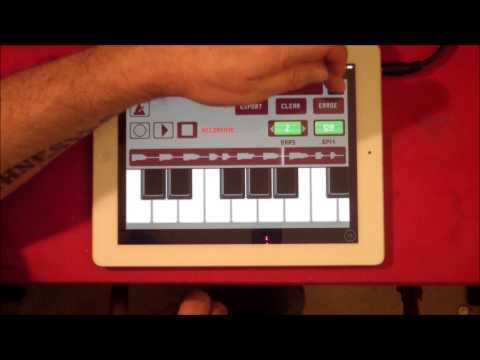 Personally I like to automate the 'LFO Key Sync' in Gadget(ie. toggle between free-running and synced PWM sweep). 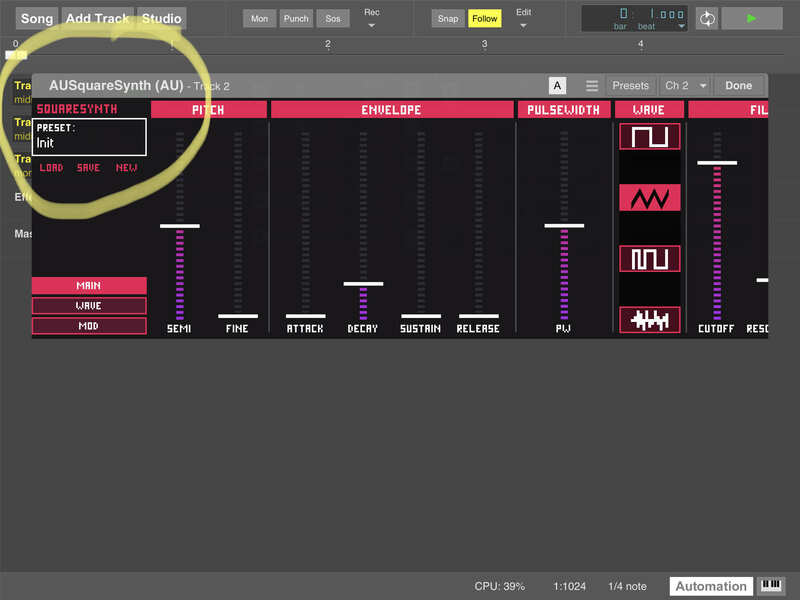 The LFO Key Sync option is there in SquareSynth 2 as well but can not be automated yet. -Metronome not working in standalone. Not in app description. ??? Talking app description, did anyone found « multitimbrality »? Such a hype for AUV3, but most of apps going AUV3 loose functionnalities. For multitimbality, I found that each midi channel can load its own synth setup or voice. You set it up under Prefs>Midi. My AU window seems cutoff on the right side, in AB and AUM. On the iPad Air2, btw. Edit: you can 2 finger scroll the AU window left and right. Standalone not loading for me. Screen 1 sec and then disappears. Any way to do the multitimbral is AU? Thats all I really care about. I don’t see a way to do multitimbral AU. I assume you could just use multi instance. Ya. Not a great workflow for me. Still...happy I bought it for single voice use. Very light CPU hit as expected, I definitely seek out sound like this sometimes. Thank you good sir. The word Kamata is pregnant/redolent enough to have me sit quietly back down. SquareSynth does cover more ground but they both come from the same extended family, I think. Judges? problem is I can’t use it as an IAA instrument in another host app (shows up as IAA, and midi destination, and is set up for note-in midi, I think?) But no go in AUM, MTS, AEM, Cubasis...so seems not usable as a hosted synth like others listed. 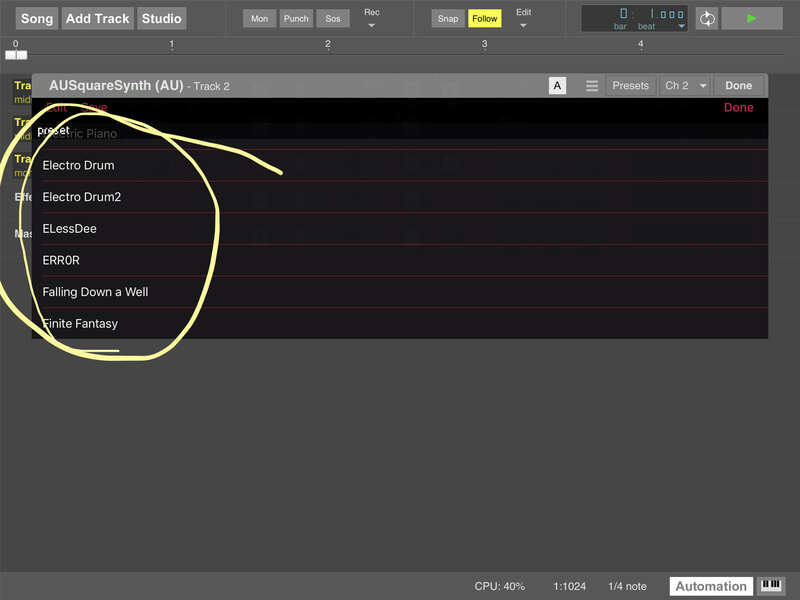 Yep, problem is I can’t use it as an instrument in another host app (shows up as IAA and midi destination). But no go in AUM, MTS, AEM, Cubasis...so strictly speaking not usable as a synth like others listed. I'll have to re-check this since I've had like zero issues sequencing SidTracker64 using other apps?! SunVox is also amazingly flexible when it comes to using tables to control & create sounds but that's slightly OT. it wasn’t til your post above that I realized I could use Sidtrackers ultra cool synth anywhere but in Sidtracker, but I can’t get it to work. Edit: BTW, just tried it again. There are the midi options, but I never got it to work with a sequencer A midi keyboard goes ok! @Samu ( or indeed anyone else ) can you share anything on the au automation functioning in cubasis yet?